Girl Scouts, part of a regional service unit called Town & Country unit composed of area community troops from Bordentown to Springfield, unite at Roebling Elementary School in Florence Township on Feb. 22 in celebration of World Thinking Day. Scouts visit the Kansas station and watch a tornado demonstration. FLORENCE — Girl Scouts united at the Roebling Elementary School to celebrate World Thinking Day last Friday. More than 130 girls from 16 troops participated, bringing together all levels of Girl Scouts — Daisies, Brownies, Cadettes, Juniors and Ambassadors — on Feb. 22. Girls were from a spectrum of area communities including Columbus, Bordentown, and Roebling hubs. Each troop that participated is part of a regional Girl Scout service unit called Town & Country, composed of 30 troops. And last Friday when the Burlington County girls recognized World Thinking Day, they did so along with millions of other Scouts around the world. Ms. Dembowski, a Cadette and Daisy leader of Troop 25136, lives in Florence. She coordinated the event along with Troop 25800’s Carrie Elliot and Lynn Crotty. The Town & Country event had a state fair theme as well that each troop incorporated into the learning experience. To begin the festivities, the girls held an opening ceremony in which they displayed various state flags prior to giving brief presentations on their specific states, including how each one’s name originated and the percentage of its people living in poverty. The girls also demonstrated community service prior to World Thinking Day by collecting nonperishable items as a project. If a girl contributed five or more items, she then was eligible to participate in a raffle contest. Ms. Dembowski said the girls collected 247 nonperishable items bound for the Florence food pantry at the Methodist Church on Broad Street. Troop leaders had selected a state randomly through a drawing last December. Troops then studied their assigned states and presented key ideas to everyone participating. 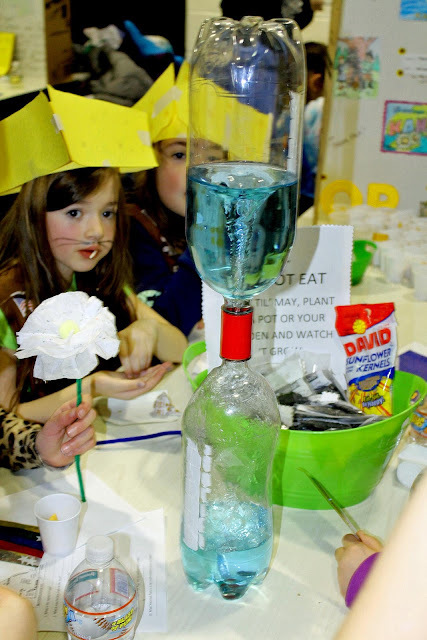 Girls used display boards, special snacks, science experiments and crafts projects to showcase interesting and creative thoughts inspired by the state. The girls throughout the evening rotated through the stations and visited different states at the fair every 10 minutes with their passports. Girls put donations in a box designated the Juliette Low (founder of Girl Scouts) World Friendship Fund. She said donations to the fund are used to support opportunities for fostering international friendships from 145 nations. At Michigan’s table, girls learned the state’s name is derived from the Native American words, “Michi-gama,” meaning large lake. The girls said Michigan has 116 lighthouses and navigational lights making it the most of any state in the United States. The girls also said the poverty level is 15.7 percent. At Georgia’s table, girls said the state was named after King George II of England. It is the country’s No.1 producer of peanuts, pecans and peaches. The people living below poverty level in Georgia is 16.5 percent. During the evening, the older Girl Scouts served as “big sisters” and guided younger troops through the fair. Two 6-year-old Daisies, Jessica Pompei, 6, and Katelyn Neshanko, 6, said they enjoyed the excitement of moving from station to station. "I liked making the flowers,” said Katelyn of Columbus. The creation of tissue paper flowers provided the craft activity set up at the Mississippi table. For these girls, it was a new experience and a chance to try something they have never done before. Bordentown’s Daphne Ozkan, 10, a Junior Scout, enjoyed her time during the state fair celebrating World Thinking Day. "I got to learn about Blackbeard (the pirate), and I got to get a treasure,” Daphne said after visiting the North Carolina table. Daphne said she learned about animals, symbols and foods found in American states.